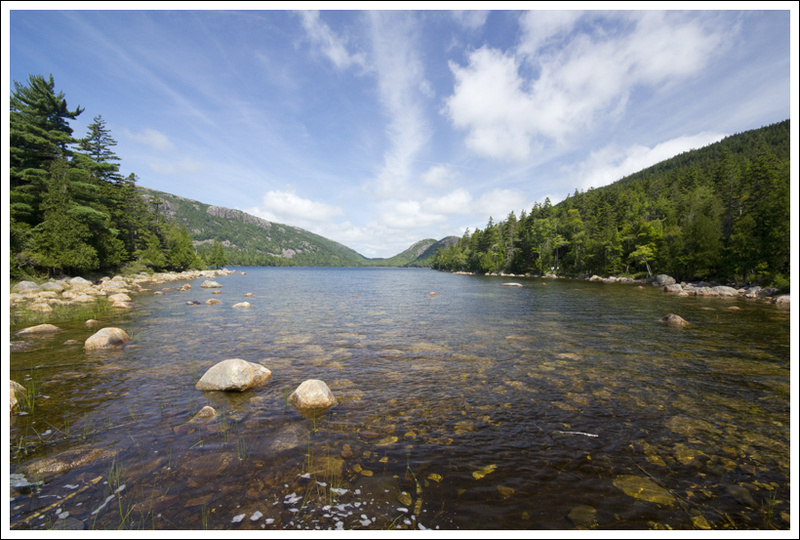 This 2.9 mile segment hike starts from Bubble Pond, crosses Pemetic Mountain and comes out at Jordan Pond. You will either need access to two cars or the free Island Explorer Shuttle Bus. Adam enjoys views from the Pemetic summit. Below: Christine climbs steeply up the trail; Views of Eagle Lake in the morning clouds; Adam walks across Pemetic in the direction of Jordan Pond; Jordan Pond. 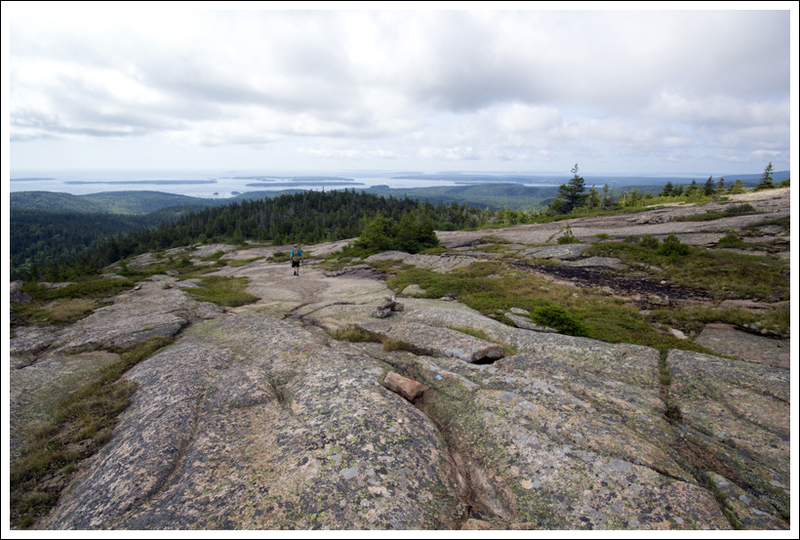 We had hiked up Pemetic Mountain as an out-and-back on previous trips up to Acadia National Park, but we decided that we wanted to try a different route this time to incorporate both sides of the mountain. We started from the Bubble Pond parking lot early in the morning. This lot has space for about 20 cars. If you’ve been to Acadia before, you will know that there will be a lot more traffic than what this lot can accommodate. The proximity to the carriage roads makes this a popular spot for cyclists to park. By 10 a.m. this lot will likely be full and you will have to park elsewhere. 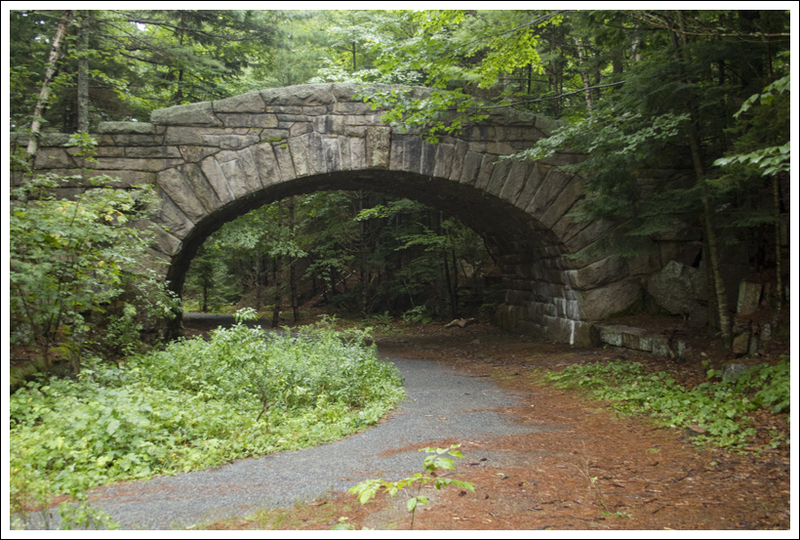 From the parking lot, we walked, taking a left, over the Bubble Pond bridge and down the carriage road. 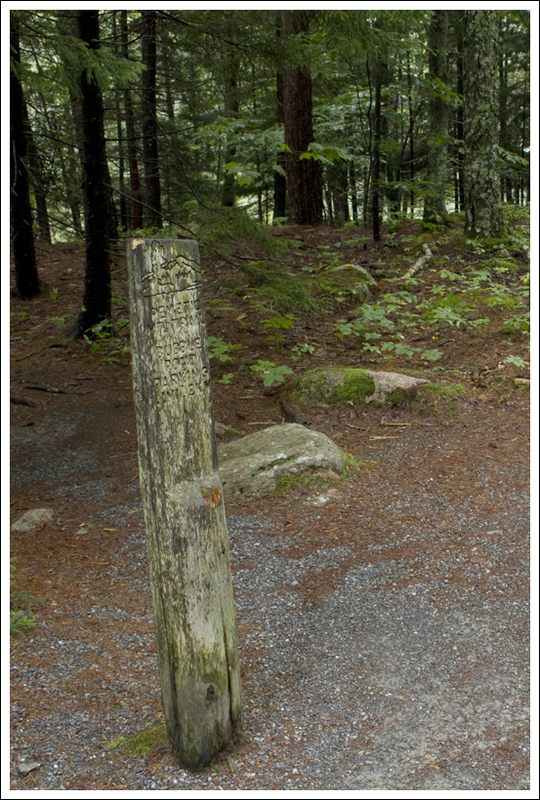 Within about 200 feet you will see a sign for the trailhead to Pemetic Mountain. 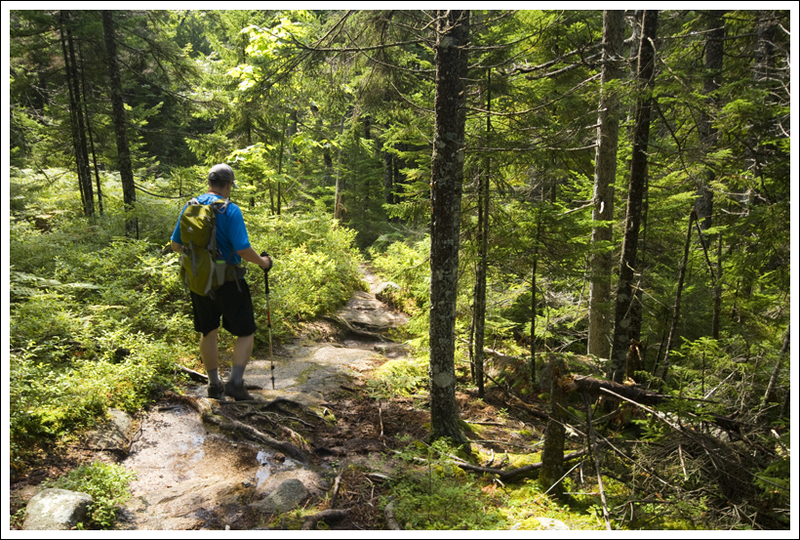 The trail starts off with a steep grade through the deep woods, climbing up through exposed roots and rocky surfaces. The rain had come down heavily the night before, so this made for some slippery footing. After about .8 miles, the trail began to open up to a nice viewpoint where you could see across to Cadillac Mountain and down to the southern edge of Bubble Pond. The trail begins to open up at this point as you will continue to rise until you climb above the treeline at the one mile marker. In 1.2 miles, you reach the summit post of Pemetic Mountain, giving you panoramic views of the mountains, lakes, and ponds around you. The Bubble Pond Bridge. Below: Bubble Creek was flowing heavily due to the previous day’s flooding rains; The first part of the hike is along the carriage trail; The trailhead marker; Adam climbs over rocky terrain. From the summit, we decided to take a different path down and went down the South Pemetic Mountain Trail (you can also take the Northwest Pemetic Mountain Trail to form around a 4 mile loop with the Carry Loop). This led across the open granite face of the mountain and we followed cairns along the way to ensure we were going the correct way. The views on the way down this way were also spectacular. At the edge of the exposed mountaintop, we reached a junction with other trails around the 2 mile marker. We headed to the right towards the junction with the pond trail. This put us back below treeline down a steep decline that was slicker than the way we went up. We were both glad we brought our trekking poles to balance us on the wet granite trail. At 2.4 miles, we reached the junction with the Pond Trail. We took a right on this which descended until leveling out. We crossed a small rockway bridge which took us right to the Jordan Pond House. The woods were beautiful. Below: Steep climbing; Tricky and complicated footing; The higher we climbed, the foggier it became. We went to the front of the house and caught one of the Island Explorer buses waiting out front which carried us straight back to the Bubble Pond parking lot and our vehicle. 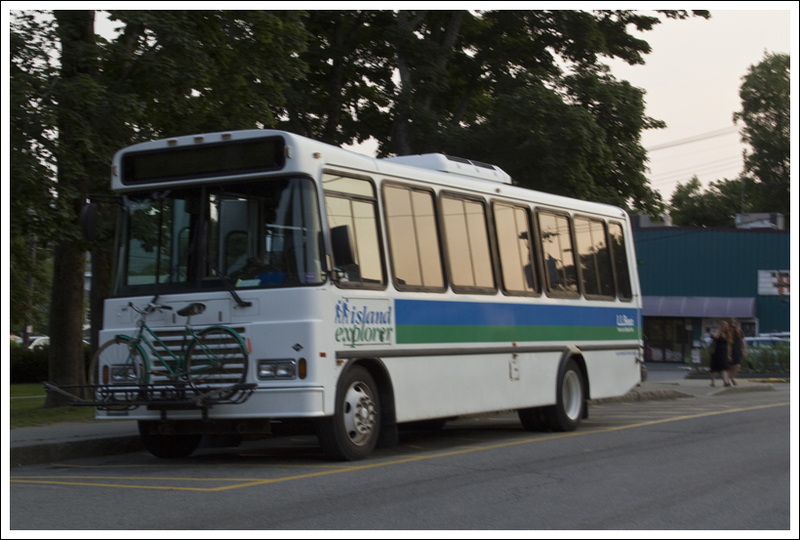 Usually I am a little skeptical about bus systems and how convenient they are to use, but the Island Explorer system in Acadia won us both over for convenience and ease of use. We used them earlier in the week to rent bikes and ride along the carriage roads. They had a few bike shuttles running in the morning from the center of Bar Harbor. We just lined up and we only had to wait about 15 minutes before the bus came to load up our bikes and took us to Eagle Lake. I brought a bus schedule with me on this hike and there were buses coming by the Jordan Pond House about every 20 minutes that could take you back to Bubble Pond. 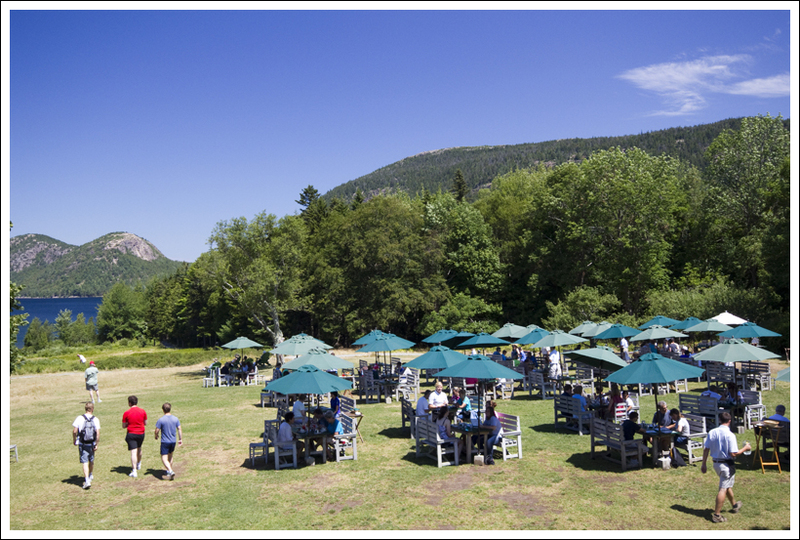 And if you start your hike early enough, you can be back at Jordan Pond to enjoy a nice lunch with popovers outside with your view of Jordan Pond and The Bubbles. There is not much of a better reward for a great hike than that. Before I share my thoughts about the Pemetic hike, I wanted to talk a little about the impact of inclement weather when hiking in Acadia. 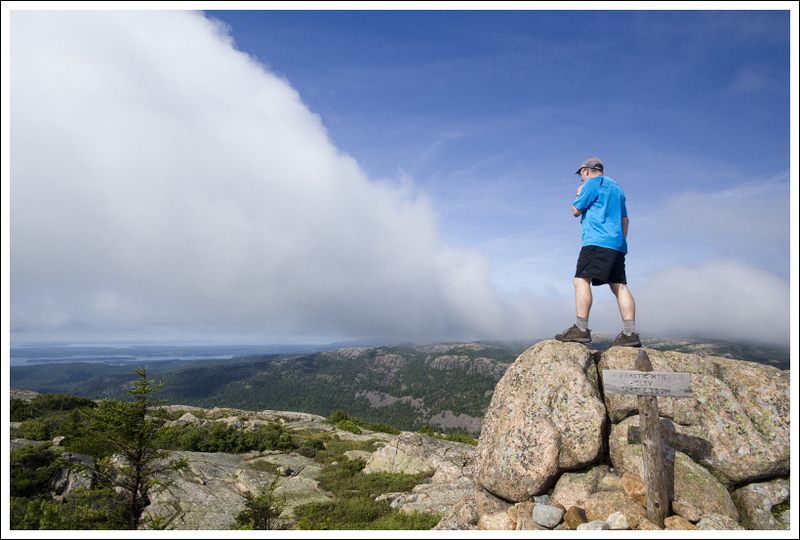 Some years, we head to Acadia and have a full week of bluebird skies and seventy-degree days. Those years are always glorious and memorable. Other years, the island seems to stay trapped under a stationary area of low pressure – with ongoing rain, fog and humidity. 2012 happened to be one of those years. We had a few nice (though still hot and muggy) days, but more days ended up foggy and rainy. Normally, if it rains on a hiking trip, you throw on your rain gear and press on. 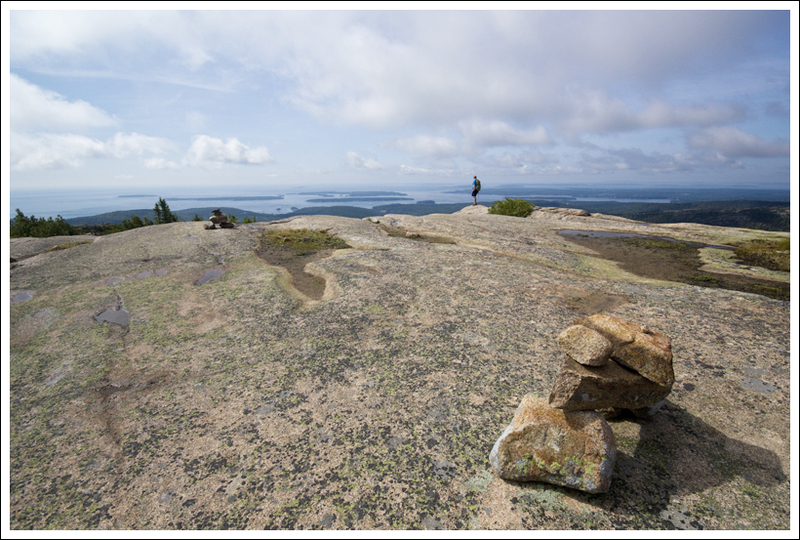 However, with all the slick, exposed granite in Acadia, it can be a dangerous place to hike when it’s been raining. Evidently, the summer of 2012 was quite rainy and a very bad summer for hiker injuries in the park. In the several weeks before we arrived, a man slipped, fell and broke his leg on Dorr Mountain, another woman slipped and seriously injured her back on Gorham Mountain, and sadly another young woman (an experienced hiker) slipped and fell to her death on the Precipice Trail. 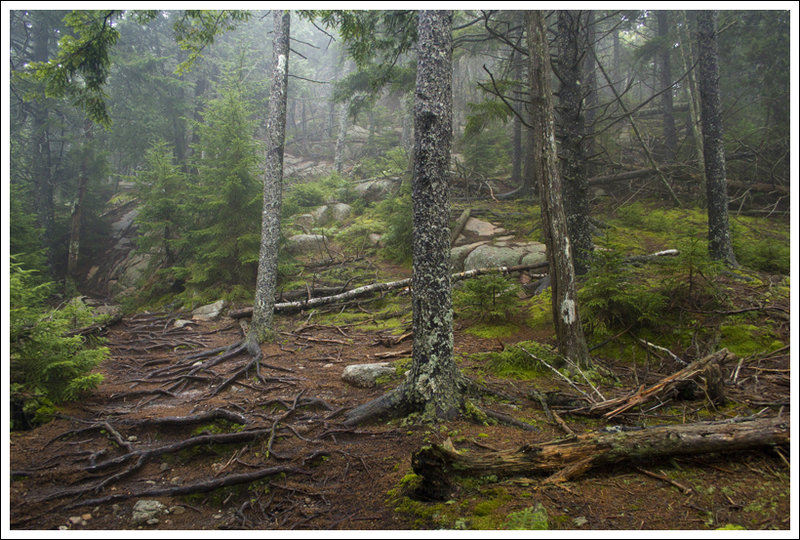 Hiking in wet, rainy conditions is not something to be taken lightly on Acadia’s unforgiving terrain. 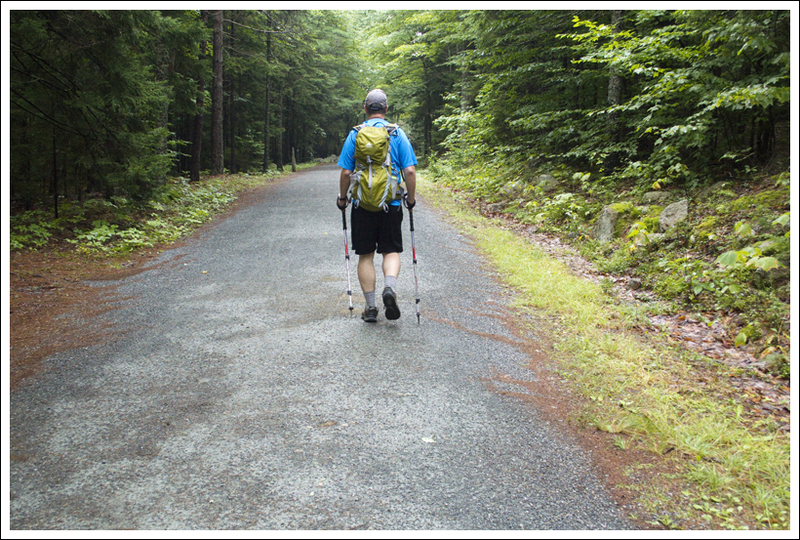 If it’s raining, and you still want to hike, try the Carriage Roads instead. They’re lovely and always safely passable. The Pemetic Summit. 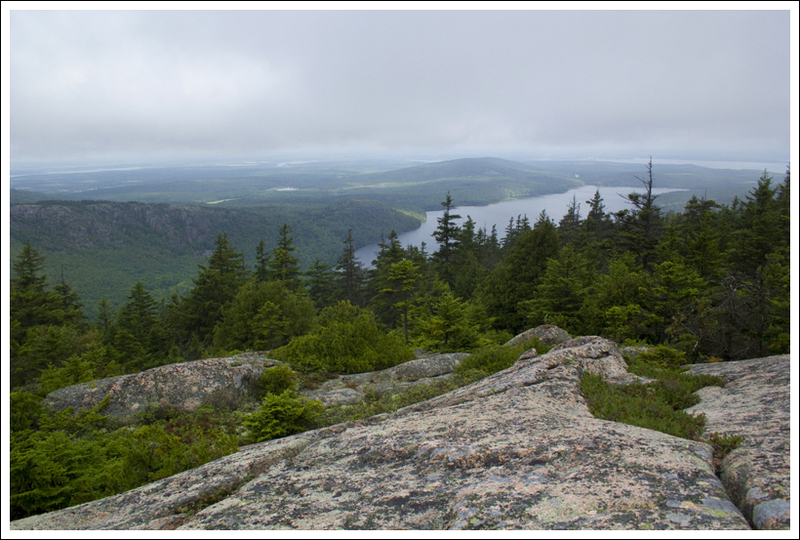 Below: Adam climbs over granite as we approach the summit; A foggy view of Bubble Pond; A view of Jordan Pond from the summit; Adam enjoys the view. 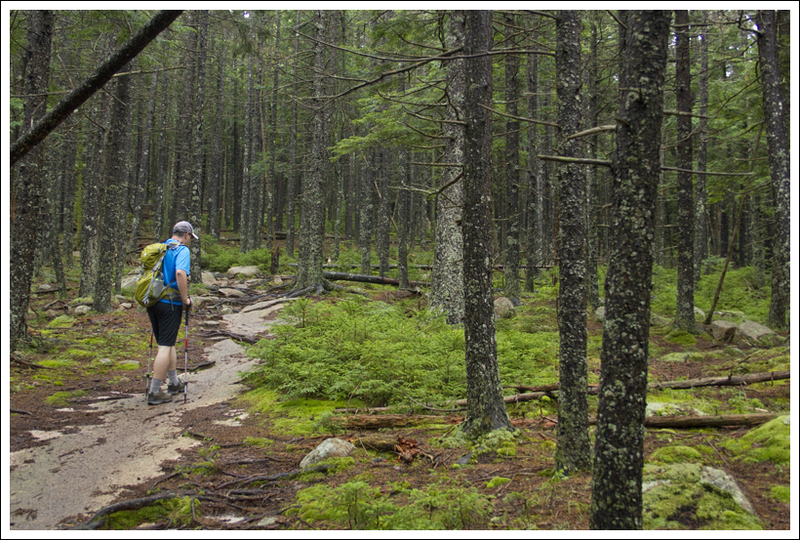 The day before we hiked Pemetic, Mount Desert Island and Acadia received a lashing of bad weather. Streets flooded, ponds jumped their banks, and waterfalls poured off the mountainsides in places where there normally isn’t any running water. The rain lasted most of the day before finally slowing to a drizzle in the evening hours. In the morning, it was still wet and foggy, but the forecast called for the clouds clear off by mid-morning. It was our last day of vacation, so we wanted to get out there and do one last hike, even if it meant slogging through a bit of mud and taking our time to be careful on slippery terrain. 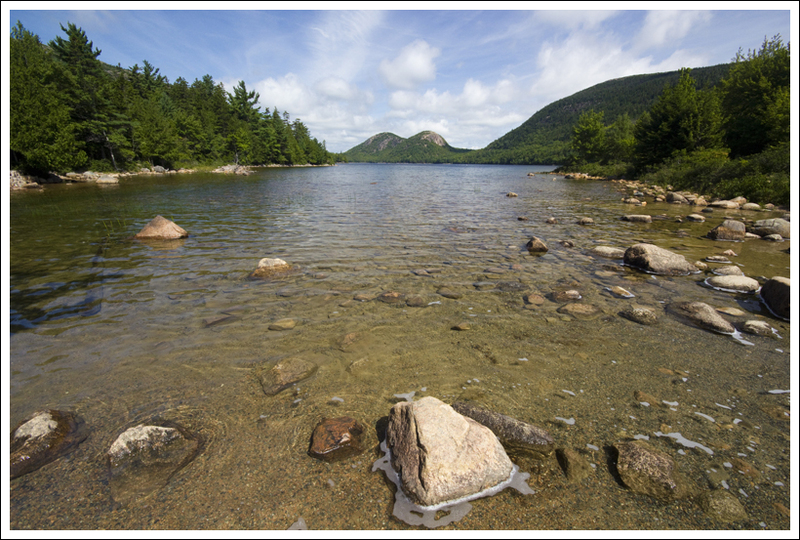 We decided to climb Pemetic Mountain, which is tucked into the space between Bubble Pond and Jordan Pond. We’ve hiked it before. I remembered it being steep, and covered with a tangle of roots and loose rock. I took a hard fall there a few years ago. I slipped on a layer of wet pine needles on granite and fell about ten feet onto a dead, and very spiky, spruce. One of the broken limbs stabbed through my shirt, into my back and left a puncture wound with a large surrounding bruise. Ouch! Needless to say, we took great care climbing up this time, choosing our steps wisely and making sure footholds were secure. I remembered the trail being much tougher and steeper than it was, but I’m in better shape now than I was a few years ago. The wooded part of Pemetic is stunningly beautiful – lush and green. There are evergreens all up the mountainside, with their tall straight trunks leading to an umbrella-like canopy of green. The forest floor is colored in a patchy pattern of soft-red of pine needles and vivid green moss. A view of the Bubbles across Jordan Pond. Below: The trail downhill went through forest; The Island Explorer Bus. As we climbed, the woods became increasingly foggy. It was beautiful in a quiet, mysterious kind of way, but I worried that we would miss out on any views from the top. 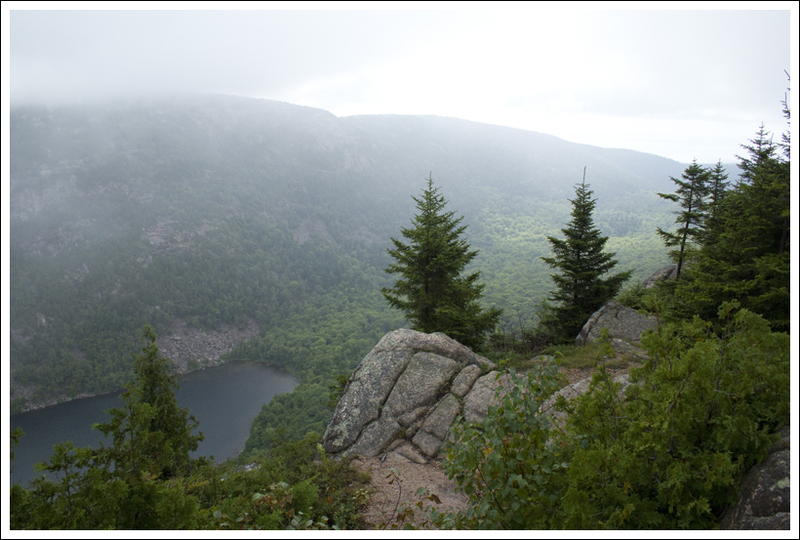 The first viewpoint we came to was at a small outcropping overlooking Bubble Pond. Banks of fog moved across the opening, sometimes we could see the pond and sometimes we could not. We took a short break for water and continued toward the summit. 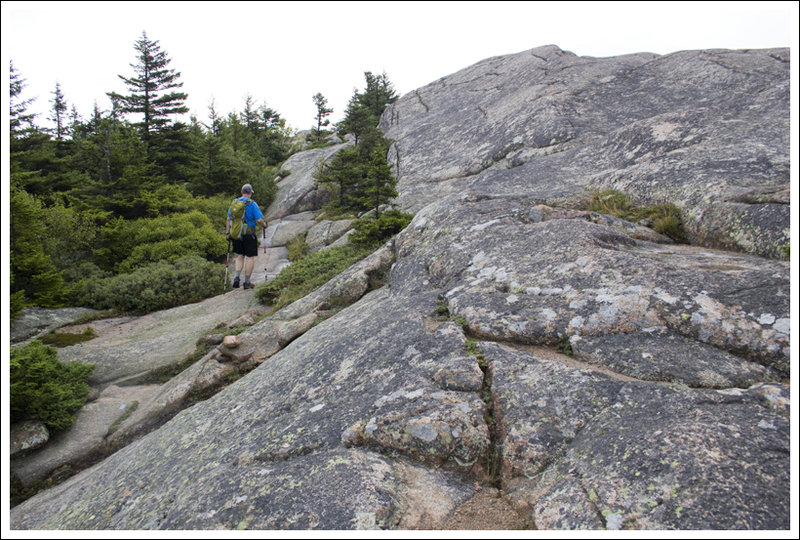 For a short stretch after the view, the trail dipped back into the forest until finally stepping out onto open granite for the final push to the summit. 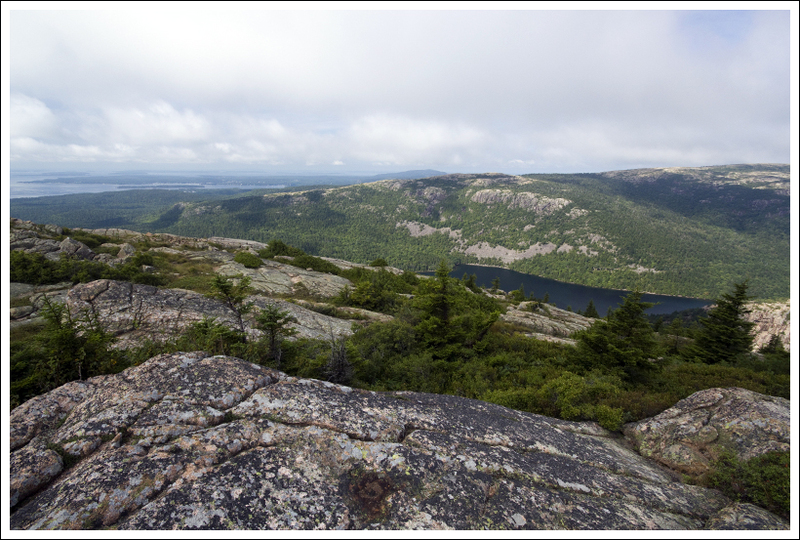 At the summit, we ended up having a decent view of Jordan Pond and Frenchman Bay beyond. There was still a lot of blowing fog and low clouds, but the openings between them were generous enough to make the view worthwhile. We chatted with a few other hikers at the summit about different hikes on the island, enjoyed the views, and ate some trail mix. We took photos at the summit marker, looked for hikers across the way on Penobscot and Sargent, and then made our way down the opposite side of Pemetic. The granite dome of the mountain was impressive on the downhill hike – smooth and expansive, offering more views of the offshore islands. Eventually, we ended up back in thick, evergreen forest for the steepest part of our downhill climb. At the base of the mountain we met the Pond Trail which took us slightly around Jordan Pond and then back to the Jordan Pond House. We contemplated getting popovers a la mode, but Adam really wanted to head back into town for lunch. We ended finishing our hike at just the right time! An Island Explorer Bus headed toward Bubble Pond was waiting for us to hop right on. It was such an easy way to hike Pemetic without doing one trail as an out and back. By the time we finished hiking, every trace of clouds and fog had cleared off! 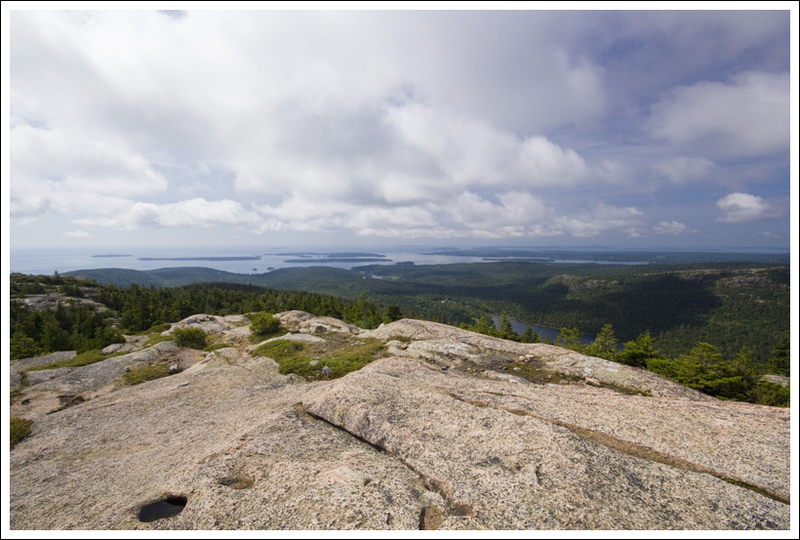 After lunch, we actually did a second hike – Gorham Mountain, which is one of our perennial favorites! 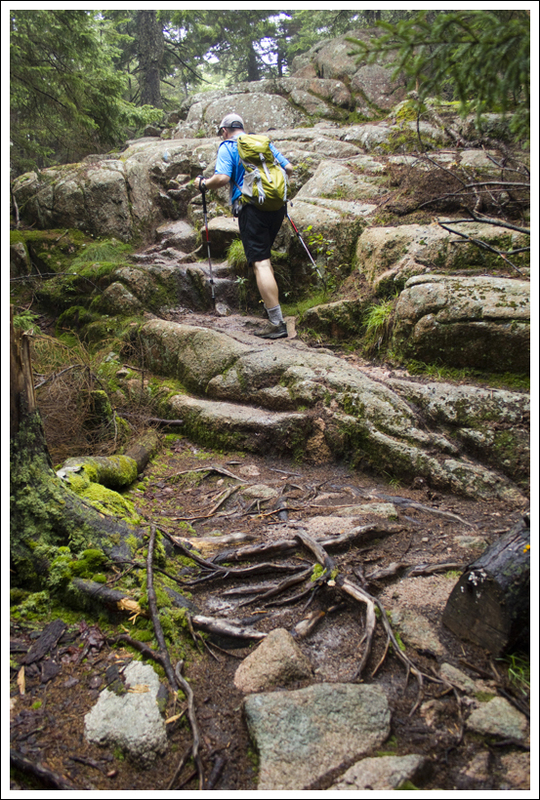 Difficulty – 2.5 The hike up and down Pemetic Mountain is quite steep, but with the short distance isn’t too grueling. Trail Conditions – 3. 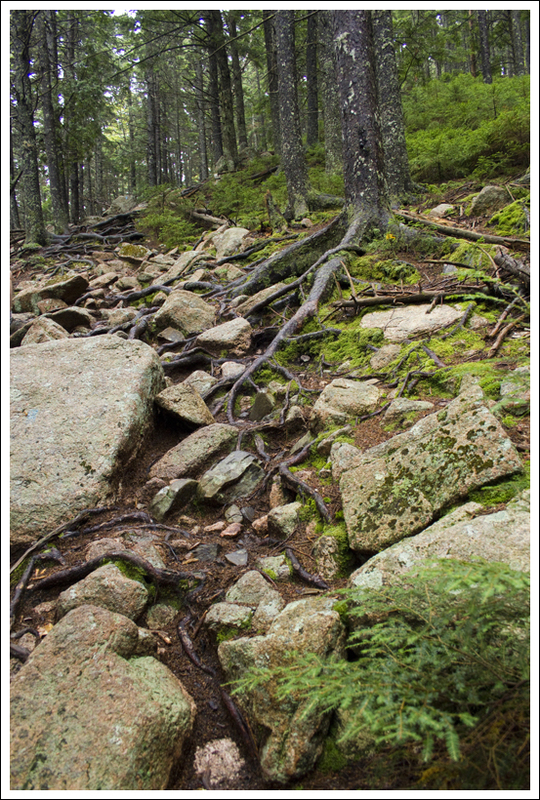 The trail is well-maintained and clear, but the roots and rocks make all of the hiking in Acadia a little difficult. Views– 5. Panoramic views for miles on a clear day. Streams/Waterfalls – 3. The parking area for the trail is alongside Bubble Creek. 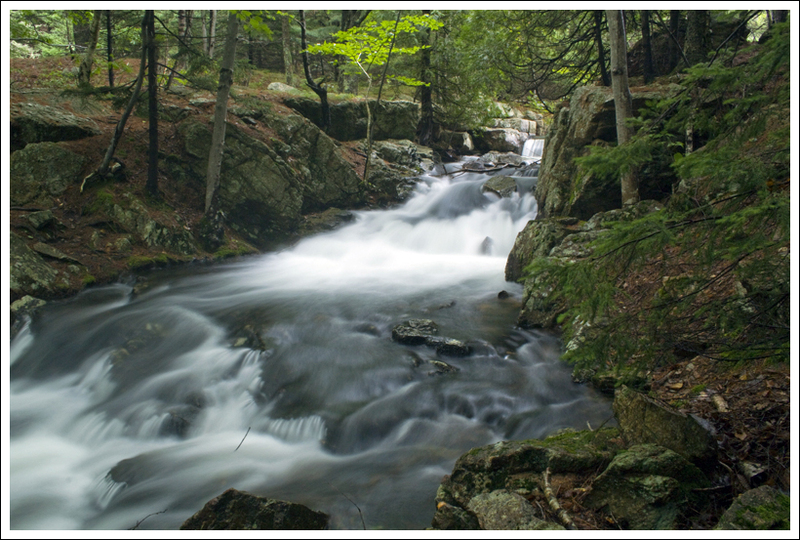 The Pond Trail also runs alongside a small stream – and of course, Jordan Pond is lovely. Wildlife –2. We only saw a few red squirrels on the trail. You may see some migrating hawks if you are lucky. An occasional loon may be spotted in one of the ponds, but typically only around dawn. Ease to Navigate – 3.5. The trail wasn’t that hard to follow as long as you followed the blazes or cairns. Solitude – 3. 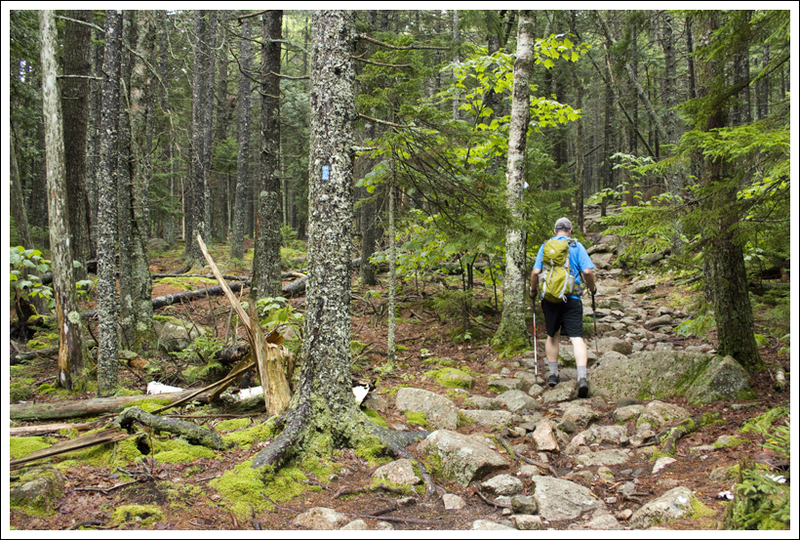 With proximity to Bubble Pond for bike riding and Jordan Pond, this is a fairly popular hike. Expect to see people lingering at the summit, but the mountaintop is so large that you should be able to stake out your own area for solitude. 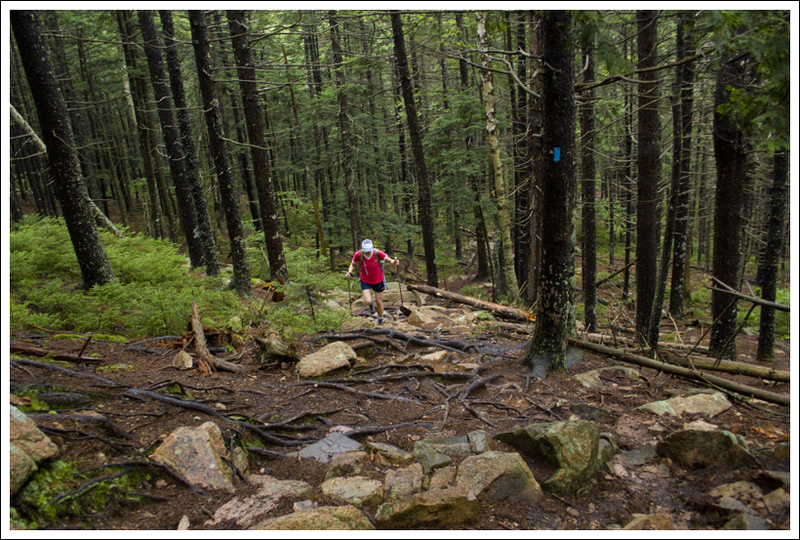 Directions to trailhead: From Bar Harbor, head west on US-233 for about a mile. Enter Acadia National Park on the left and take a right onto the Park Loop Road. Travel about 1.9 miles until you see the Bubble Pond parking lot on the left. Head down towards Bubble Pond on the carriage road. The trail head starts off on the left about 200 feet along the carriage road.